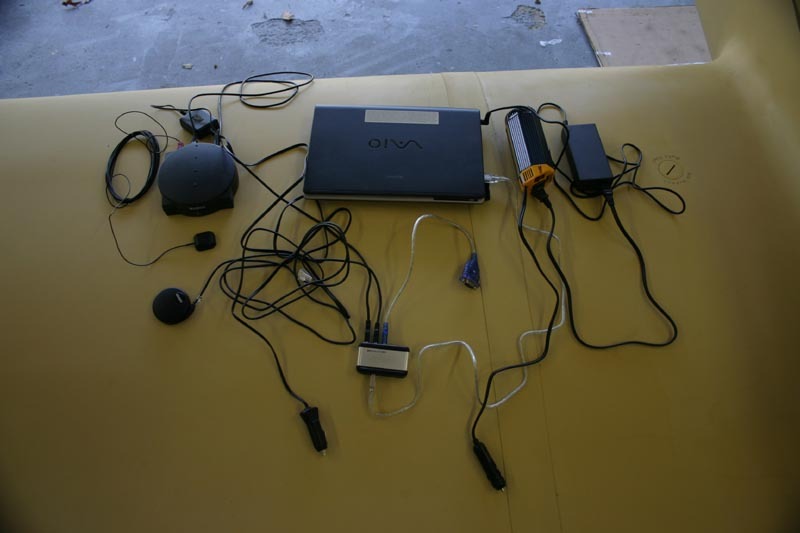 Here are the components of the system: WxWorx (pronounced "weather works") on the upper left, along with it's tiny XM satellite antenna, GPS antenna, laptop, USB hub, 110 VAC inverter (so I can run the laptop without buying an expensive converter), and serial to USB converter. The WxWorx box and antenna are about $450, and the USB WAAS GPS is another $80. The first night I had this stuff, I connected it all up in my car, and here's what the weather looked like. It's Nexrad weather, just like on TV, except clouds are also shown. Green stuff is nothing to worry about, yellow is nastier, and don't even think about flying into the red. You can see that unless you're IN the clouds, you can easily steer around the rain showers during VFR flight. Of course you can do that without XM as well, but XM lets you see the big picture of where and how much of it is out there, which is a big help in deciding weather to press on, go around the mess, or turn back and land somewhere for a while. The screen can be set up about 20 different ways, but here I have the sectional up top and XM weather on the bottom. This is how I fly if there's weather out there, otherwise I just fill the screen with sectional. The screen is dark here because it wasn't plugged in and the screen was dimmed (I've set that differently now). 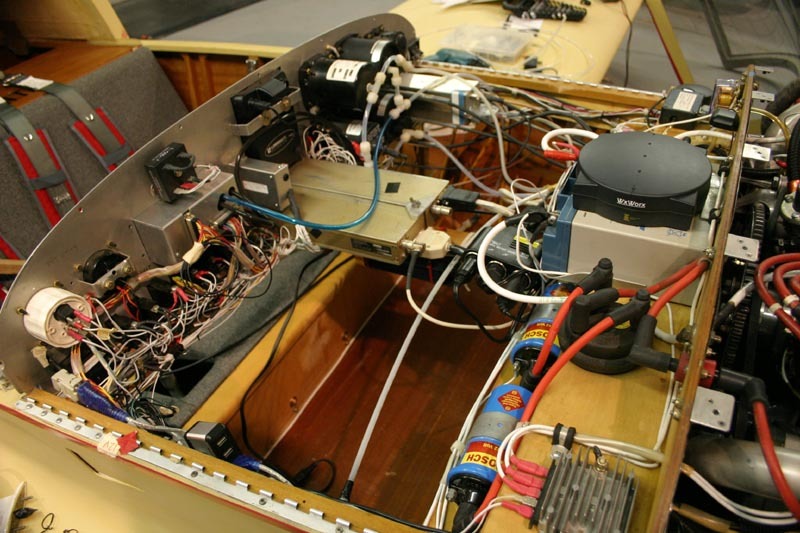 Here are all the parts installed in the plane. The antennas need a clear view of the sky, just like XM Radio. I stuck the WXWorx box on top of the battery, for lack of anywhere more convenient. I weighed all of this, and it's only a few pounds. The laptop is 3.5, the rest is 2.5 pounds more, for a total of about 6 pounds. 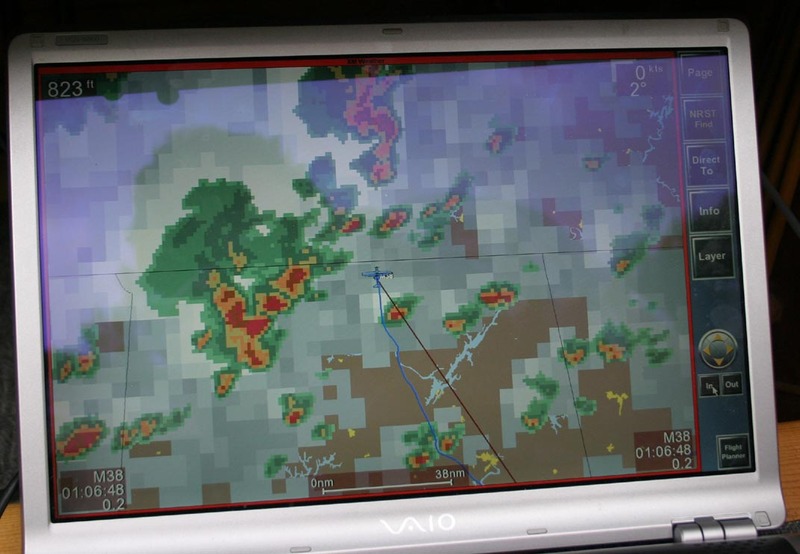 The XM weather box can be bought with viewing software for the laptop. That's probably fine, but since I already had Chartcase, I just used it, as it will also display XM weather info. Chartcase will superimpose XM satellite weather onto your GPS track (with other data showing wherever no clouds are shown). This data is less than 5 minutes old. The Chartcase subscription also includes current Sectionals in electronic form, sent on a regular basis. There are several subscription options, depending on how often you want the updates and whether or not you want stuff like high altitude airways or approach plates. I get updates three times a year, and the subscription is something like $190. One of the "in flight" options is to superimpose your flight path on top of a sectional. This is my favorite part of the package, as it eliminates the need for sectionals (although I do carry some old expired ones in my flight bag just for backup). 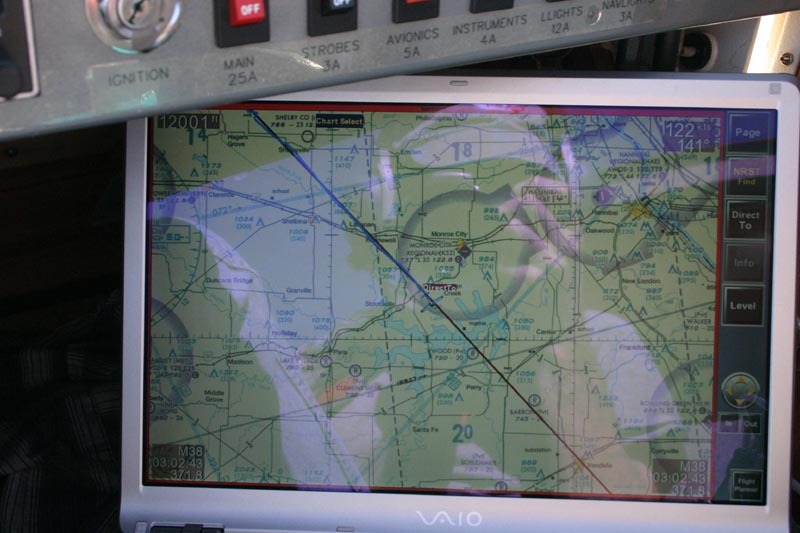 The electronic version is legal in the eyes of the FAA (Electronic Flight Bag, or EFB). 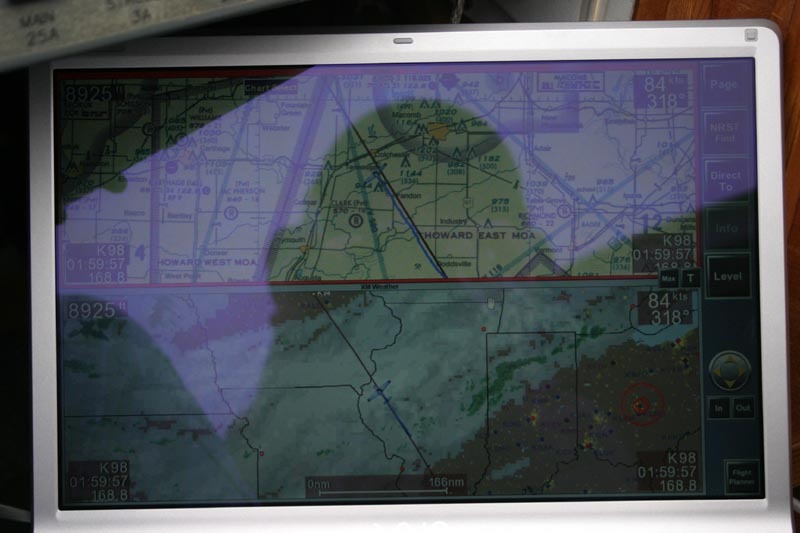 The Chartcase flight planning module can be used prior to the flight while connected to the internet to plan a flight using DUATS information (there's a connection feature built in to Chartcase). 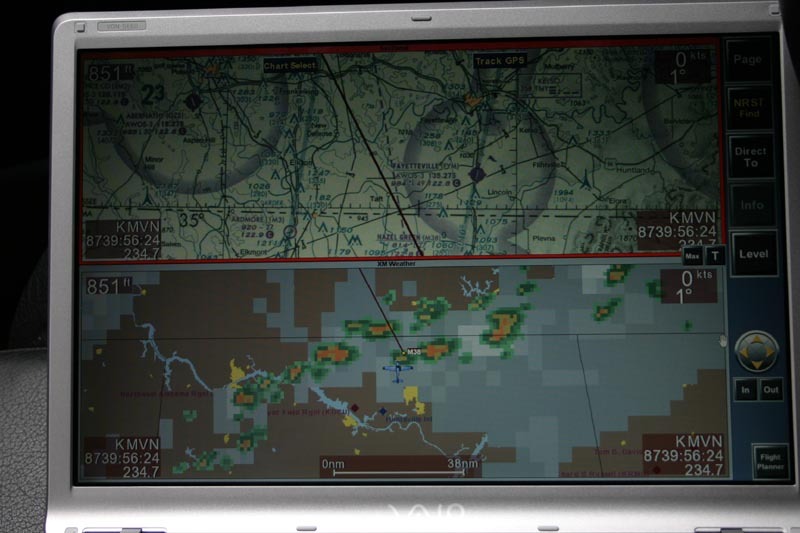 The wind vectors that you see are available either online or through XM weather. 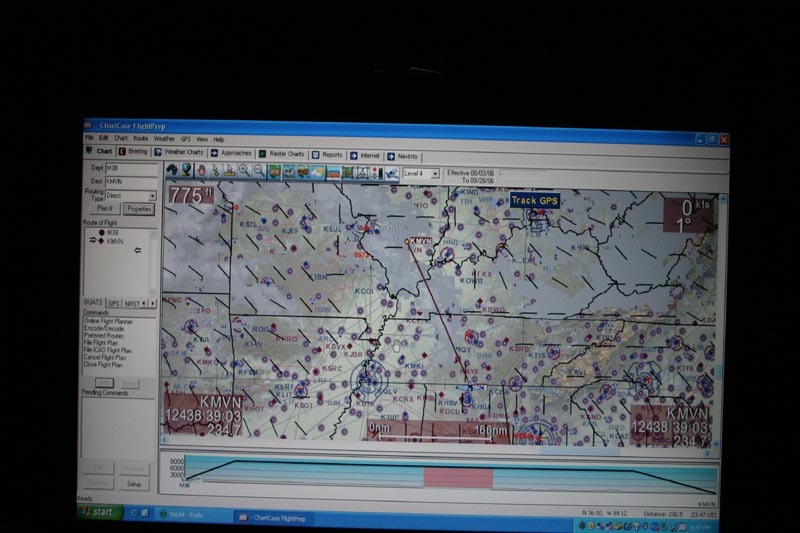 The "profile view" of the flight is shown at the bottom, and controlled and restricted airspace is shown, as well as wind vectors (they weren't turned on for the profile view yet in this photo though). 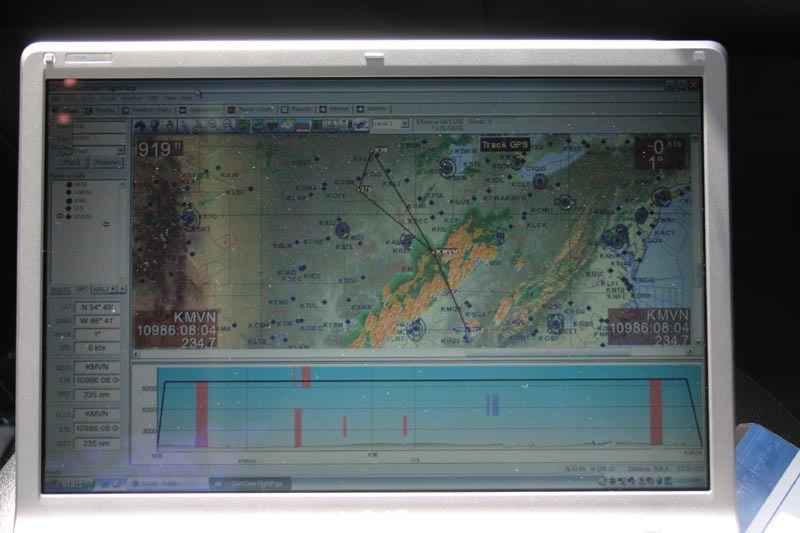 The bright red areas in the upper screen are current TFRs. This flight was from M38 to MVN, which I made a few days later. Here you can see a line of heavy showers a few days before the Gathering. This flight plan goes all the way to Iowa. Clouds are turned off in this view. you can see in the profile view at the bottom that terrain is depicted as well as the altitudes of various controlled and restricted airspace. When flying, the airplane is shown in both views. Lightning strikes can also be viewed, but there were none to show on this flight. Winds aloft at various altitudes are also available during flight, making it easy to determine the best altitude at which to stretch your fuel. The XM subscription is either $30 or $50 per month, but most aviation folks will want the $50/month version. The first time I used the software, I was approaching a green patch of light rain on the display but I didn't think there was any rain ahead. I was under a 12,000' overcast at about 9500' and couldn't imagine how the bright skies ahead would harbor any rain. Then just as the nose of the plane on the GPS touched the green blob of rain, little raindrops started hitting the windshield! I became an instant convert to XM weather. Here you can see the airplane's track (blue) superimposed on a current sectional along with the intented track (the purple line). I took this picture because it was a rare example of me following my intended flight path somewhat closely. My laptop is a Sony Vaio. Most new laptops have a super glossy screen, which doesn't make a bit of sense if you are trying to view it outside. This laptop was the smallest one at Office Depot, and had a screen that was about half as glossy as the rest, and was very light, so that's why I chose it. As you can see here, it's not as nice as watching TV in your living room, but it is useable. Direct sunlight is a bit of a problem, mainly because it's easy to lose the cursor. I tested it in direct sunlight before I bought it (the store manager walked out to the parking lot with me to test it), and it is usable, but could be much better. Chartcase requires about 800MHz of processor speed, so a relatively old laptop will work. This laptop cost me about $1000, but I needed one anyway. The built-in wireless is really handy around the house, or when traveling. Of course you can buy a Panasonic Toughbook CF-18 or CF-29, which truly are daylight readable, but weigh a lot and run about $4000...a little out of my range. 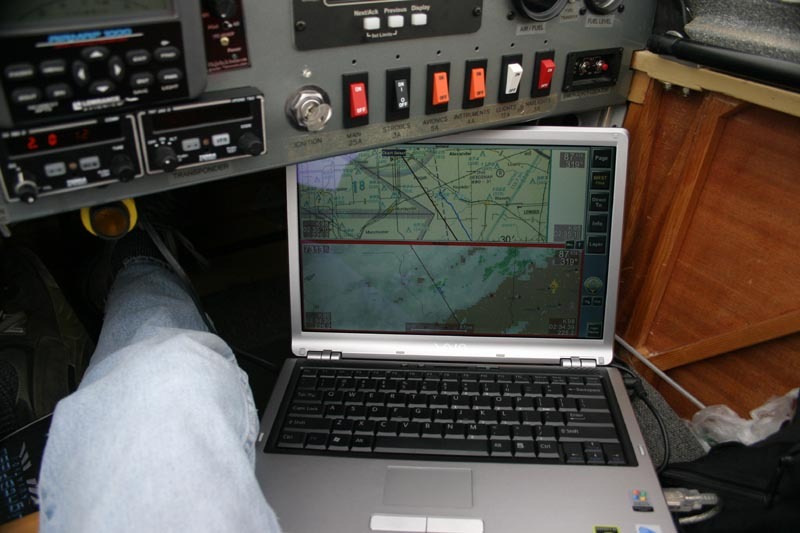 And another way to get XM satellite weather in the cockpit is to buy a Garmin 396 or 496, but the screen is tiny, it's visibility is no better than the laptop, and when it becomes obsolete you have to throw the whole thing away and buy a new one! Another option is to use a super bright display hooked to the laptop, or maybe even a touchscreen, but really daylight readable touchscreens are about $3000, and weigh about 9 pounds! I'll wait for them to come down a bit before I consider that. 1000 nits (cd/m2) is considered the minimum for "daylight viewable" screens. And then you still need an onboard computer of some sort to run the thing. My laptop is perhaps 500 nits (I haven't been able to find out for sure), but it sure is convenient. It sits nicely on the seat next to me, is big enough to clearly see sectional details on (and it can be zoomed in and out if necessary), and it has a touchpad and a keyboard. I tried a friend's LS800 display, but it wasn't as readable as this laptop, cost twice as much, and had no keyboard or touchpad. This sounds like no biggie, but what do you do when you need to reboot it? Here's a screen shot of the Chartcase flight planning software, for a the trip I made to meet Joe Horton at Beckley, West Virginia. We wanted to meet halfway between his place in Pennsylvania and my place in Alabama, so we picked Beckely as the halfway point. You can see the clouds, wind, and terrain in the profile view at the bottom, as well as restricted and controlled airspace that you'll need to work around on your flight. This was before I had weather superimposed on the top view, so none is shown there. You can see all the TFRs that Joe had to dodge on his way down. There is a free online version of this named Golden Eagle that is DUATS based (see http://www.duats.com/cirrus.shtml). If you want XM weather and the regular electronic sectional updates, you'll need to visit the Chartcase folks at FlightPrep). If you don't know what DUATS is, you're missing out on some really cool FREE service that the US Government is providing for you. You tell it where you're going, where you're coming from, your fuel burn rate, climb rate, descent rate, cruise speed, etc, and what time you're flying, and it'll calculate (based on winds aloft) your flight time and fuel burn rate. More on that at the DUATS website). WxWorx is the brainchild of a local Huntsville weatherman, and can be found at the WxWorx website). This stuff seems expensive, unless you have a personal time machine airplane like my KR2S, and you fly alot to far away places. If I were to get stuck in a hotel for 2-3 days and miss work (not to mention hotel bills), I'd have just paid more than my year's subscription to WxWorx and Chartcase. And then there's the safety of knowing exactly where the nasty stuff is...which is pretty much priceless!